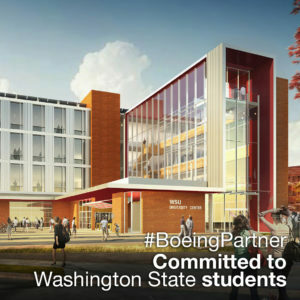 EVERETT, Wash. – A $250,000 gift from the Boeing Company means Washington State University’s new building in Everett will be equipped with state-of-the art technology when it opens its doors next fall. In recognition of the generous gift and the Boeing Company’s long-standing support for the university, WSU President Kirk Schulz said the university will designate the fabrication lab on the first floor of the new 95,000-square-foot building in Everett as the Boeing Innovation Studio. The Boeing gift will allow the 900-square-foot lab space to contain an array of state-of-the-art equipment, including a 3D printer and scanner, concept CNC mill, laser cutter and more, providing students with the opportunity to learn and create using the very tools that they will work with when they enter the workforce in Washington’s aerospace and other cutting -edge industries. The new building will house existing science, technology, engineering and math (STEM) programs in Electrical Engineering, Mechanical Engineering, Software Engineering and Data Analytics, as well as Integrated Strategic Communication, Hospitality Business Management and Organic Agriculture Systems. All of the building’s lab spaces, including the Boeing Innovation Studio, are designed to showcase innovation at its finest, as the engineering students work on challenging capstone projects, club projects, and hands-on coursework. The spaces will serve to bring together students from multiple disciplines as they tackle open-ended, challenging problems. ”The curricula offered and student activity in the building will be enhanced by such unique infrastructure, as a wind tunnel, devices such as a robotic arm, as well as all the basic equipment necessary to teach the fundamentals of mechanical, electrical and software engineering,” said Paul Pitre, chancellor of the WSU North Puget Sound at Everett campus. More broadly, the engineering labs serve to fulfill three of WSU’s strategic plan goals of providing a transformative student experience (with emphasis in improving retention through an enriched set of student experiences), building a stronger support structure to recruit and retain transfer students, and facilitating student engagement in high-impact learning experiences. WSU’s newest campus in Everett uniquely serves the local population by providing a seamless pathway for transfer students as well as maintaining a strong collaboration with community colleges in the region, including Everett Community College, Edmonds Community College and Skagit Valley College. WSU North Puget Sound at Everett has also participated in the WSU Boeing Mentorship program for several years, received Boeing scholarship support, and will be participating with its first interdisciplinary Boeing Scholars cohort this coming year.